Last week, a video of a Nexus 6P being snapped in twain caused quite a ruckus around the internet. But while some people got very worked up over the fact that a grown man can produce enough force to break a 7-millimeter-thin slab of metal, glass, and silicon, others correctly pointed out that the validity of the "bend test" was compromised by the cracked display. Indeed, logic implies that when a phone is half broken, it is structurally weaker than when it is not broken. Wanting to prove his point, the YouTuber proceeded to buy another Nexus 6P over the weekend and film one more video of himself attempting to break it. 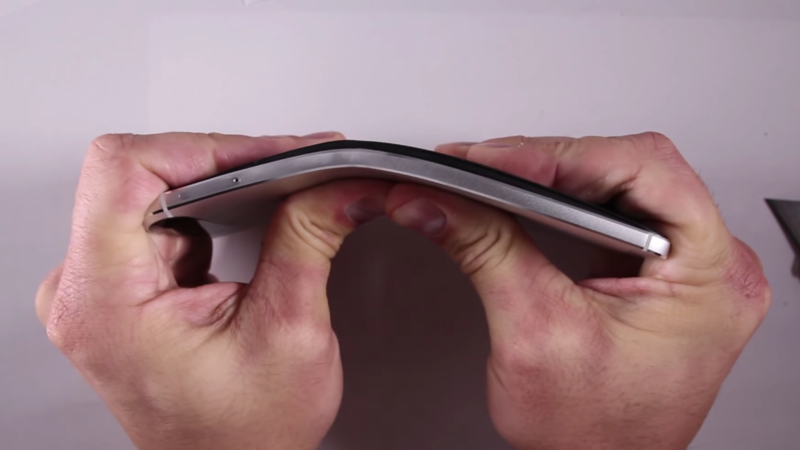 As it turns out, he was actually able to bend the phone in half after applying sufficient force. Who knew things could break if you tried to break them? We realize many of our readers will be rightly shocked to discover that the Nexus 6P is in fact not unbreakable, and that it is especially vulnerable at its weakest point around the power button. Apparently, this point lines up with where the battery and motherboard meet, and so it only requires the strength and willpower of an adult Homo sapiens to render the phone unusable. 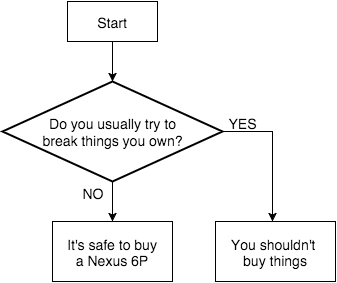 This is undeniably a grave concern to many potential owners, and so we went ahead and created a handy flowchart for you to be able to judge if this is going to be a problem. We have yet to find any feasible workarounds for current owners, but some have reported that simply not trying to snap your phone in half actually solves the issue entirely. So far, we've been unable to confirm this with official sources. Others claim to have had mixed results with being too weak to bend several layers of metal, and some have even suggested that behaving like a sane human being will do the trick. We're quite skeptical of that last one. Fortunately, this seems like something that a future software update could fix, and you can rest assured we'll have the OTA link as soon as it pops up. In the meantime, here's one last quick reminder of how you should not be holding your phone, as it has reportedly caused the screen to become unresponsive.